I've been trying to figure out all day how to express my feelings about Harry Potter and the Deathly Hallows Part Two but it's turning out to be more difficult than I thought it would be. There is so much more than just a single movie involved in DH2. It seems to be the end of an era. When the last book was published it was bearable because we still had the movies to look forward to. Now the last movie is out and my inner fangirl is feeling a bit lost. I've cried through previews and interviews for months now so I knew that the first time I saw the movie it was going to be rough. I was extremely lucky to win tickets to a pre-screening last night and it was even more brutal than I thought it was going to be. Even though it was brutal, I LOVED this movie. I went in with really high expectations and they were blown out of the water. The movie is non-stop, can't-catch-your-breath action. Mix the action of the battle with the emotional roller coaster that takes place and I was a mess!! I won't go into specifics because I don't want to post spoilers but every moment that I loved from the book is in this movie. Every moment that made me cheer out loud while reading made me (and the entire audience) cheer when it happened in the movie. Every moment that ripped my heart out in the book is there. Seeing these actors, who so beautifully play these beloved characters, act out these heart wrenching moments induced serious ugly crying. At one point in the movie I was crying so hard that my friend Rae said to me "Amy, you've got to breathe!" I've been emotional all day as my mind wanders back over the movie. I wish that there was some way I could personally thank J.K. Rowling, each actor, the director, the producers and anyone else involved in this movie for doing all they could to make it perfect. It's obvious that everyone involved has great love and respect for this series and its fans because of the product that they have created. "The stories we love best do live in us forever. So whether you come back by page or the big screen, Hogwarts will always be there to welcome you home." This video montage is perfect way to wrap up my thoughts on this amazing movie and book and movie series as a whole. 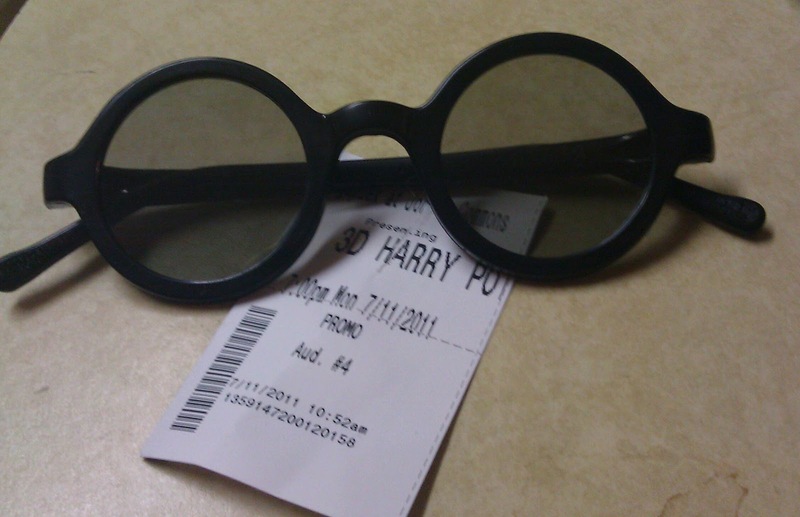 ﻿ps- I saw the movie in 3D, which I wouldn't recommend because it hurt my head, but I did get to keep the really cool glasses so it did have its perks.